The ongoing list of failed search engine companies is deep and wide. Remember the likes of Excite, Lycos, or AskJeeves? Search companies that have evolved with the times and requests of their users, have thrived while those long-dead companies failed due to lost profits or because of acquisitions that changed the framework of their original offerings. Did you know that Google’s founders were willing to sell the company to Excite’s CEO at the time for less than $1 million? An offer he happened to refuse. Would search have transitioned to a primary topic in the board room had that offer gone through? Although Google (s goog) is one of the world’s largest companies with close to a 70 percent market share in search, it must still continue to evolve lest it join the search dead pool. Looking at it and at Microsoft (s msft), we can clearly see where search technology is going from here. The next big battleground search companies must tackle is something called semantic search. This is a technology that promises to truly deliver that Star Trek computer where all the data in the world is linked on graphs and can be queried as one large database. Once this happens, search engines will become answer engines that are capable of conducting reasoning and inference and have the ability to understand context. Some companies are on the right track, but many have yet to truly understand what semantic technology means, and how it will benefit them. Semantic by definition simply means “of or relating to meaning in language.” Semantic technologies have been in existence for a long time and seek to derive meaning from information and use supporting tools such as data mining, natural language processing among others to garner insight and inference from data sets. Semantic Web technologies are a family of specific technology standards that are extremely well-suited to relate data on the Web and inside enterprises because they provide an abstraction layer above existing IT technologies that act as the bridge to interconnect data, content and processes. From the search portal perspective, semantic technologies can really be thought of as a new level of depth that provides more intelligent, capable, relevant and responsive interaction than with information technologies alone. CIOs and CTOs are realizing that their traditional IT methods aren’t the end-all be-all architectures they once were. The way we see search is shifting dramatically – and semantic technology is playing a large role in this transition. Google and Microsoft’s Bing are two examples of search providers that are incorporating semantic search technologies through the use of graph databases and are acting as initial adopters of this technology. Oh, go get a graph! With the rise of big data, garnering context from unstructured data sets has become increasingly difficult for companies of all sizes. Through the use of graph databases semantic technologies are assisting with some of these problems – helping to tie everyone and everything together with a unique bond of relevance, ensuring that search results are high quality in nature. Google’s Knowledge Graph and Microsoft’s Satori are each search engines projects to explore this technology. Google uses knowledge graphs to describe the semantic relationships between people, places, objects and intent. This semantic network currently contains 570 million objects and over 18 billion facts about relationships between different objects that are used to truly understand the meaning of the keywords entered for search based off the users’ preferences and intent. Put simply, when a user conducts a query, semantic technologies create a graph of information for the user that pulls insights from different formats to create an over-arching viewpoint related to the original query. These types of tools denote a meaningful connection between the resulting information from your original searches. 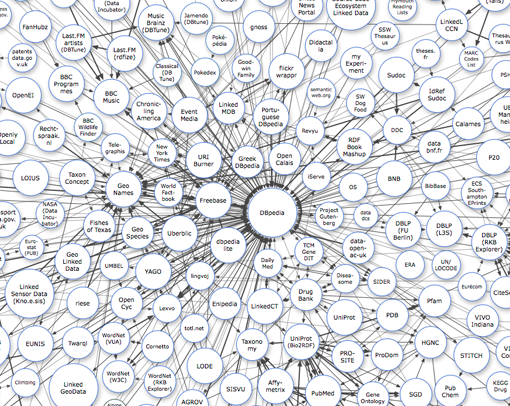 Similarly, Facebook’s recently introduced social graph maps interconnections between its users. Search turns into find. The next generation of the Web is one that will adapt to the user searching for the content, not the other way around. The lesson here is that looking into different forms of mathematics and applying algorithms to garner inference about customers will create a new model of search that will provide marketing professionals with the tools to dramatically change the industry. The prediction that search would become increasingly semantic and graph-based has thus far proven to be true. The nature of semantic technology is disrupting the traditional marketing experience as companies turn to big data, automation, algorithms and graph-data to retain customers and increase sales. As consumers look for the answers to complicated questions via search query, with the help of semantic technology, marketers can try to sell that same consumer what they searched for soon after they looked for it. Companies that fail to realize the drastic benefits of this technology will likely fall behind. Keep an eye on Facebook, Google, IBM and Microsoft. These companies see semantic technology and the benefits that sematic web provide for search as an innovation investment, so it is likely something you will be hearing about a lot in the near future. Charles Silver is CEO of Algebraix Data. While semantic search must and will eventually happen, it will only happen very slowly, for the simple reason that Google has always been extremely loath to make any substantial changes to their their search engine. They already have the lions share of search, and don’t want to take any chances of alienating the users they already have. The detriment to users is not only in not having semantic search yet. People have become so ingrained with the idea that Google IS search, that they don’t realize there are possibilities out there for greatly improved search UI which making searching faster and more efficient. Take a look at Slikk (still in beta) as an example. Great article on semantics. Is there a search engine that is really semantic? Google is changing they searcher engine because is the way to reach better the answers of the users and to relate the engine with the personal information of the user profile. But hey, check GoPubMed.com and/or transinsight.com. We are doing semantics since 10 years! Upon the query and collated the result into catagories. It gave me exactly what i wanted on the first page 9.75 % of the time. Then inference find was acquired and its excellent results were lost to the public, and maybe everyone. Then a massively inferior search tool named Google came along and i forced into a lobotomy. I am thrilled to read your article that inferenced based results is coming front and center again after a 12 year drought. Thanks for your feedback and we are excited as well. I wrote a high school paper on the semantic web ten years ago, somehow this thing has been around the corner for a decade and still no sight of it anywhere. The semantic web is here and no longer a pipe dream. Companies like Google, IBM, Department of Defense, Microsoft, Walmart, and etc. (all major tech titans) have adopted the semantic web as a standard. Now we wait for the semantic web generation to be fully evolved and companies we never heard of will be tech titans of the future. So, is this a semantic commercial?